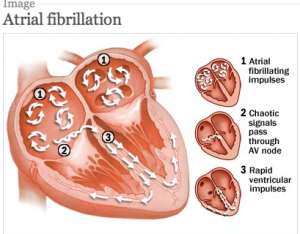 Atrial fibrillation (AF) is the most common heart rhythm disorder–by a long shot. It affects–and often afflicts–millions. AF is the most common heart-related reason for hospital admission. In America, more than 1 in 4 individuals will have AF in their lifetime. The incidence of AF increases with age, but it affects the young and middle-aged as well. Wear-and-tear diseases like high blood pressure, sedantarism, obesity and sleep apnea increase the likelihood of AF, but AF also afflicts the athletic and nimble. The symptoms of AF can range from truly asymptomatic to completely disabling and everywhere in between. AF is an irregular heart rhythm affecting the heart’s upper chambers: the right and left atria. Normally, the sinus node (the natural pacemaker cells in the right atrium) controls the heart rhythm. This creates a regular pulse at a normal heart rate which is conducted via the AV node (the heart’s central north-south highway) to the pumping chamber. In AF, the upper chambers are overcome by a series of micro-short circuits resulting in atrial heart rates of 300-500 beats per minute. Because the AV node blocks a variable ratio of these the ventricular rate is irregularly-irregular. In many patients, the AF heart rate is faster than normal, but in others it is not. This electrical chaos is AF. In the past year, I have written about AF frequently. Here is a link to some of my posts on general atrial fibrillation topics. And some past favorites…Atrial Fibrillation 101, AF-ablation 301, and the most recent AF-ablation fall-2010 update. AF does three bad things to people: By predisposing to blood pooling in the non-contracting atria, AF increases the risk of stroke; by causing chronically elevated hear rates, AF increases the risk of heart failure; and because AF causes an irregular rhythm and lower output, AF makes people feel poorly. Stroke prevention: Before 2010, the difficult-to-use blood thinner warfarin was the only means to prevent strokes in AF. However, in late 2010, the exciting and novel blood thinner, dabigatran (Pradaxa) was released. As of late 2011, the FDA has now approved the second non-warfarin blood-thinner, rivaroxaban (Xarelto). Here are my archived posts concerning both warfarin and dabigatran (Pradaxa). Rhythm Control: The aim of rhythm control is to prevent the atria from fibrillating in the first place. In the past, the only way to do this was with anti-arrhythmic drugs, of which there are many. In the past decade, however, for selected AF patients, catheter ablation has emerged as a superior strategy for rhythm control. Ablating AF is a special interest of mine. Here is an archive of my posts on catheter ablation of AF. 2012 update on AF ablation: Things have changed in the world of AF ablation. It’s easier. I, like many ablation-ists have reached a threshold number of cases where we feel comfortable with catheter manipulation. Technology has greatly improved as well. For instance, non-xray imaging technology (think GPS) have been enhanced, and this leads to more precise placement of burns. Blood-thinning regimens, saline-irrigated catheters and a minimalist movement towards making less burns have all increased the safety of AF ablation. For both patients and AF-doctors, AF ablation remains a ‘big’ procedure; but it’s surely gettin much easier and more commonplace. I recently wrote that AF ablation may be an easier journey.